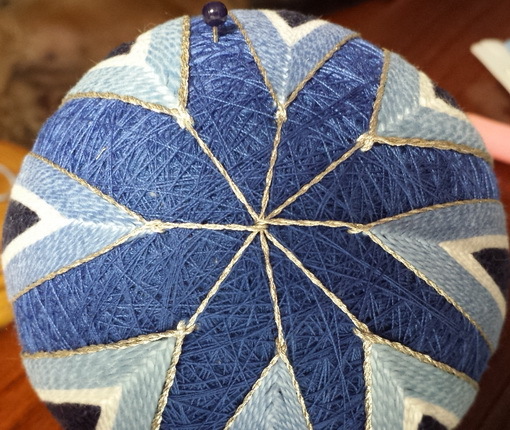 You should know that stitching does not happen overnight. 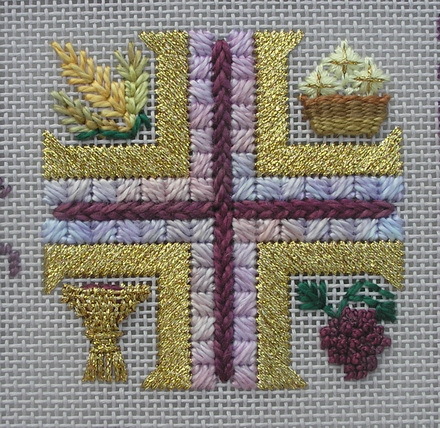 I probably stitched on the background and letters for a good three weeks and maybe longer since I know it got boring. Big projects like Wicked are home projects; you just don’t pack these up and take them to a 2 hour stitch-in…at least I don’t. 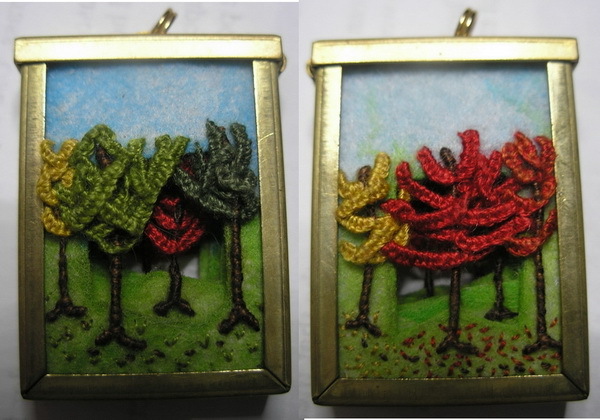 I like to have them set up in my stitching nest and it is usually the one in my bedroom, where I can get away and just stitch. 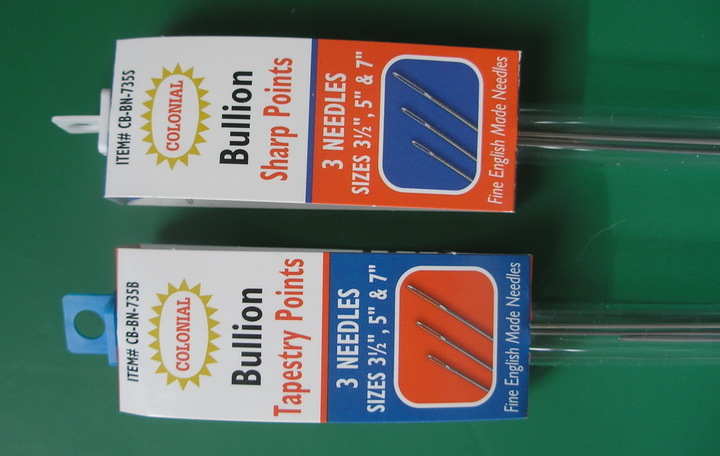 These times always remind me of the old Calgon commercial….”Needlepoint take me away!” I have my TV with recorded shows and my needlepoint, who could ask for anything more? 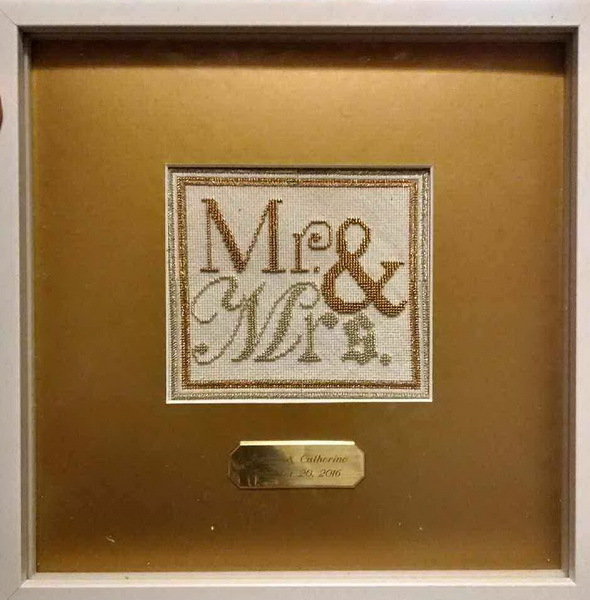 I usually have small projects (anything smaller than 12 x 12 inches) that I can take to a stitch-in or stitch downstairs in the family room stitch nest. 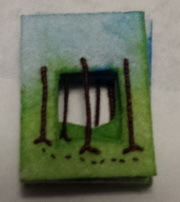 Sometimes these are just my doodle canvas to audition stitches for the big project or another piece. And then there is the computer work that I often let get away from me…my own that is. If I have a teacher’s work I keep on top of these…they have a schedule and so do I. We all have deadlines and other things to do in our lives. 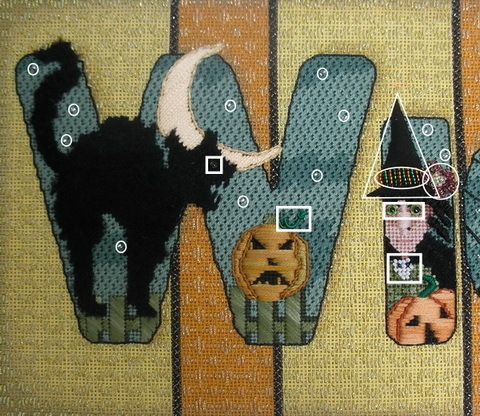 I really like Melissa Shirley’s “Wicked”…I guess, otherwise why would I stitch it? 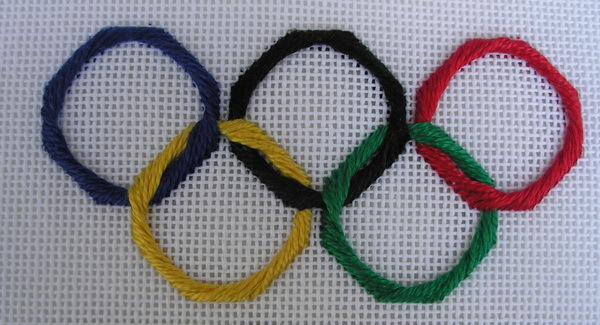 I can’t imagine buying a piece of needlepoint I didn’t like let alone stitching one. 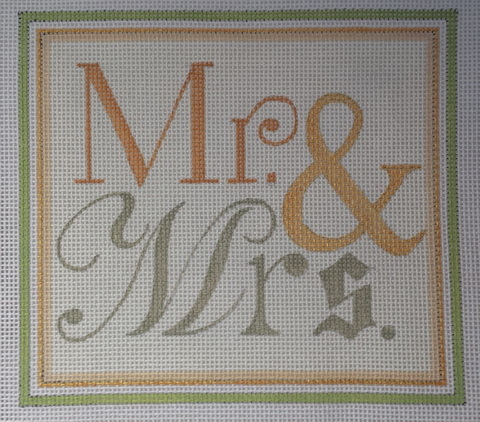 Now that’s not to say that while stitching a piece of needlepoint I have not become less enamored with it. 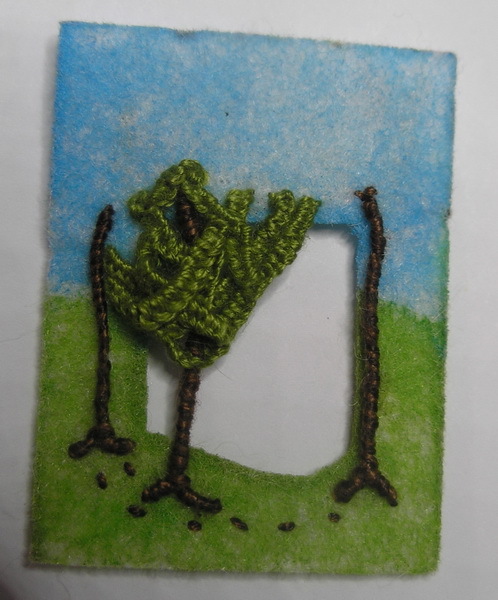 But I don’t think I have ever abandoned a piece of needlepoint; I even completed a notebook class. 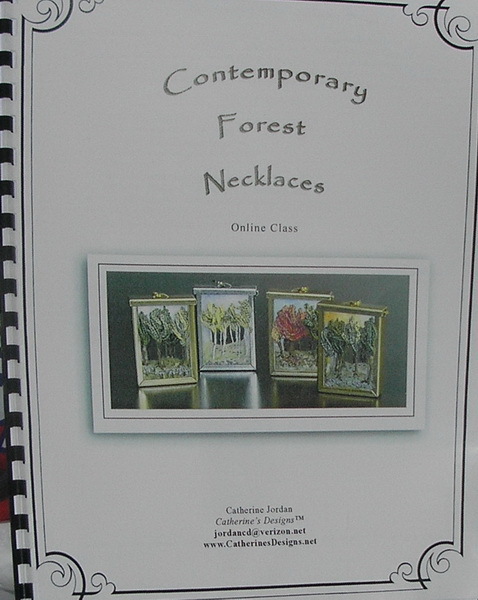 (https://sudukc.wordpress.com/2012/01/02/wilanna-bristow/) Wilanna Bristow, my first ever seminar teacher, even told me she had never seen one completed. 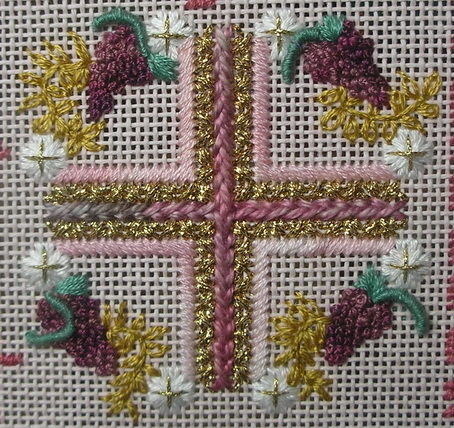 I have taken a technique class at seminar that I knew I was not taking for the piece, but to learn the technique or a class from a particular teacher; and I knew I would not complete the pieces after class but I stitched on them during class and kept all the information and samples in a notebook. The remaining supplies I incorporated into my stash. Again I started with the “W” and moved right. 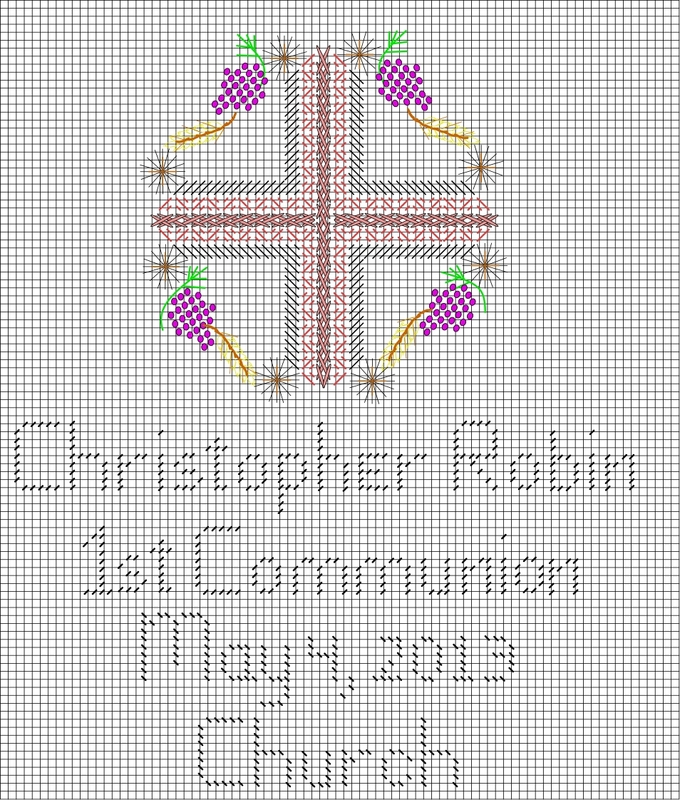 I left all the beading until the very last but I’ll tell you about that as we go along. All the little white circles on all the letters are beads representing stars. All these were left until “Wicked” was stitched. 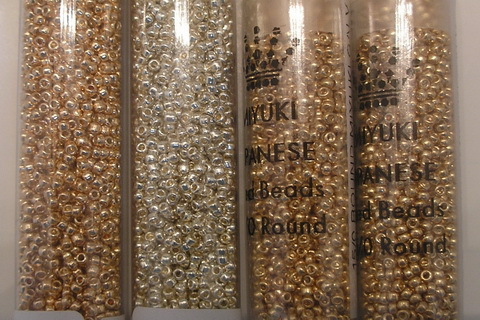 More about beading later. 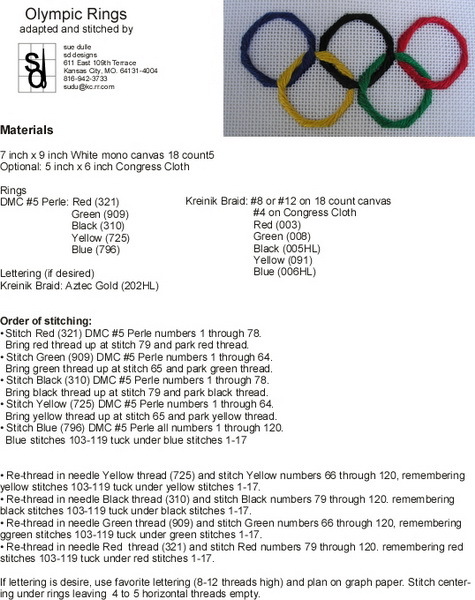 I am not going to tell you specific threads, because I feel that is part of the stitch guide and should be protected by copyright. 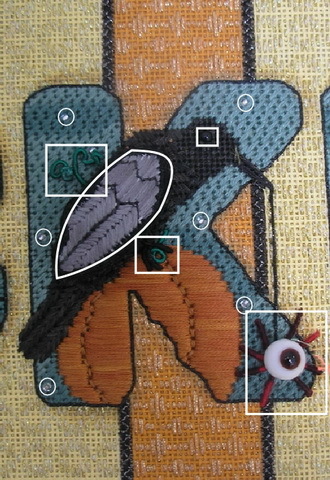 The stitches are also protected by copyright …not the stitch but their use in this project. 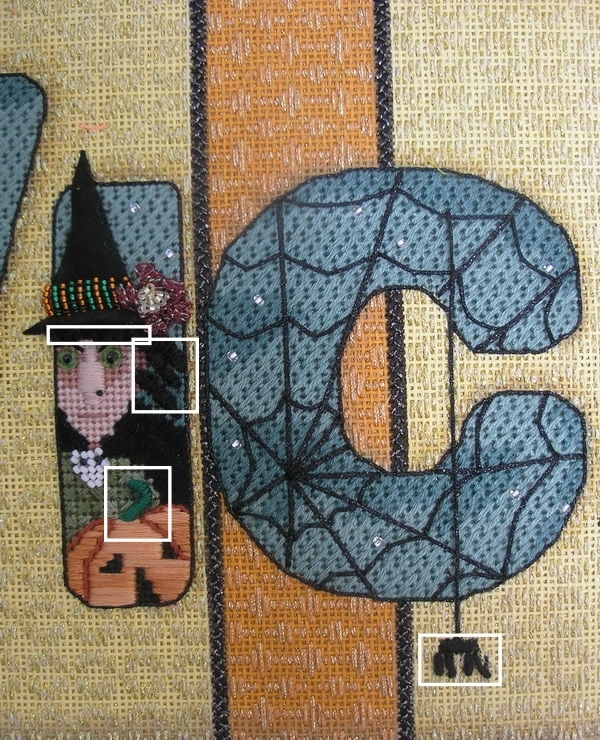 But since you can see the stitches in the picture I will use names. Letter W: I started with the moon. 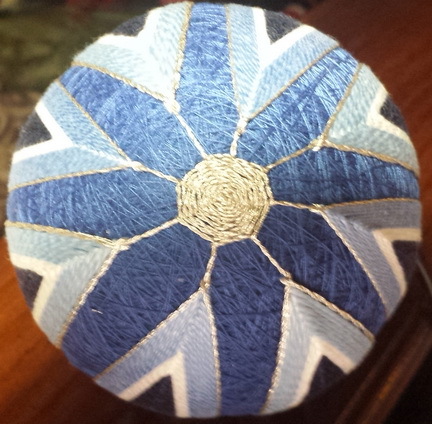 It is lightly padded with a stranded thread (I may have gotten the padding thread from my stash) and then stitched over in Diagonal Gobelins with a thread that had some glitz. I outlined the moon also, since the cat was stitched with a black furry thread and did not want to be dragging this into the moon. I padded the vertical slates of the fence and the center of the pumpkin only before stitching over them with the appropriate threads. 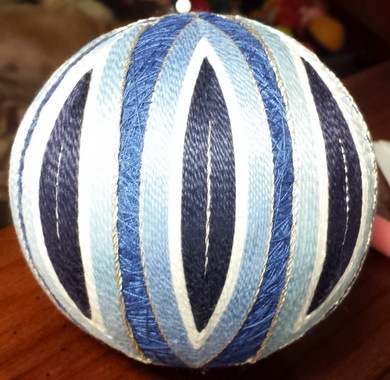 I used the same thread to pad the areas as I used to stitch them. 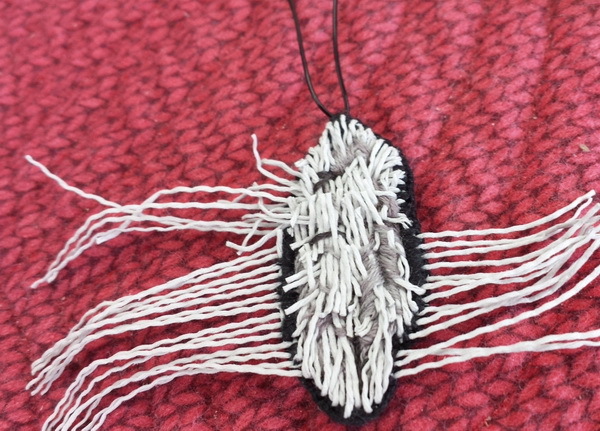 The cat called for a stitch that to me seemed more difficult to do with the furry thread so I changed it. I used a brick stitch for the cat’s body and random stitches for his tail. 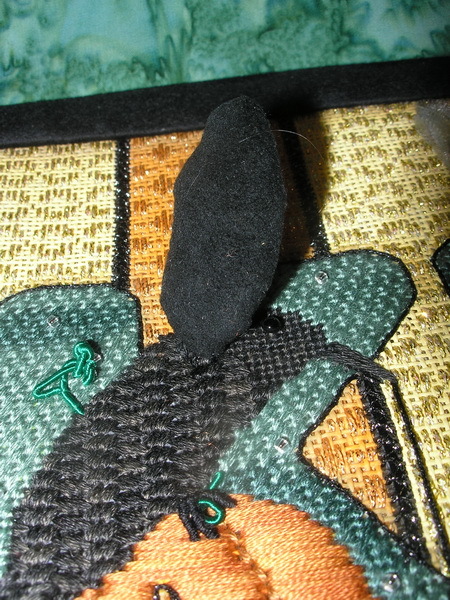 I also used a stranded thread to stitch the two fangs on the face, I though a furry thread was not needed and another thread would make them look more like fangs. On hindsight, who was going to notice this but me? You would have to be too close to the canvas to notice this, but what can I say…it was my choice and at the time it felt right. 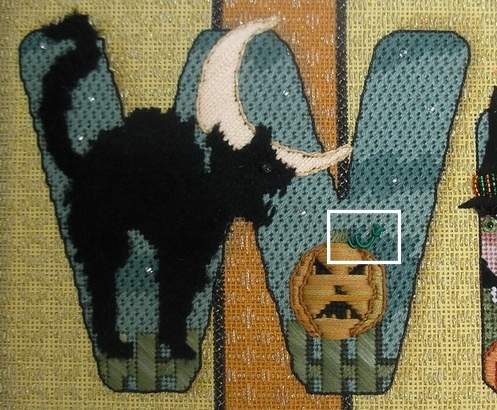 I left the cat’s eye (white square) and the curly q (rectangle on picture) on the pumpkin for later. 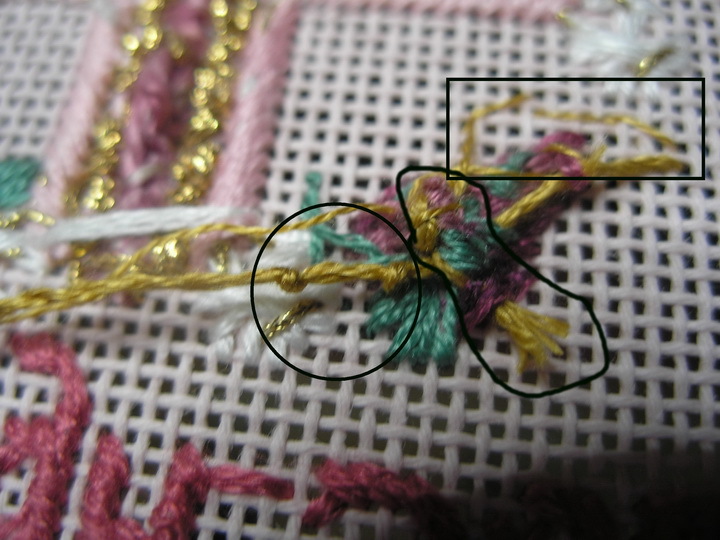 I did use a highlighter in the stitch guide to note the areas I was leaving to do latter. 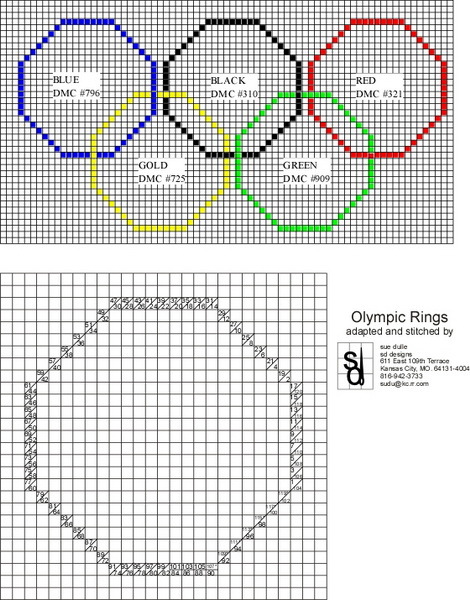 It is easy to miss these details once you have stitched a large project. 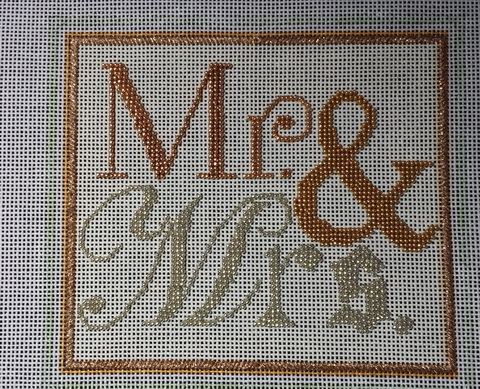 It has taken a long time to stitch and you are excited to get it finished and may even be stitching on a date deadline, so it is easy to overlook a small detail that will bug you later on. 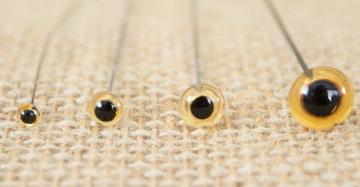 Just mark the stitch guide or keep a notebook handy to make notes. 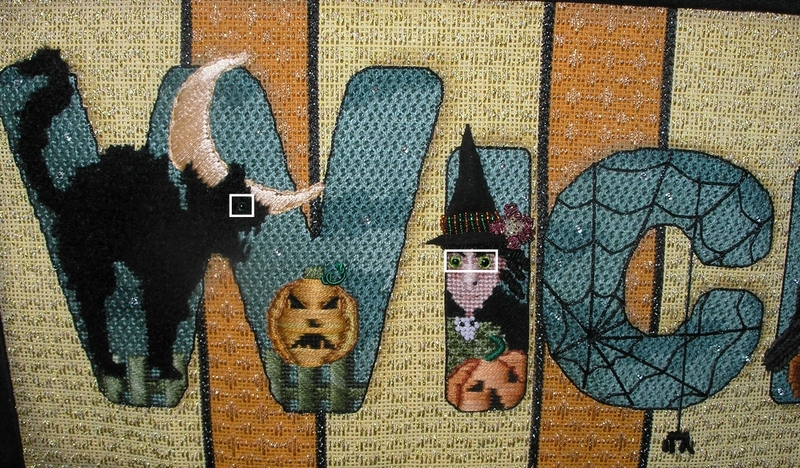 I outlined the “W” after I finished all but the final embellishments. 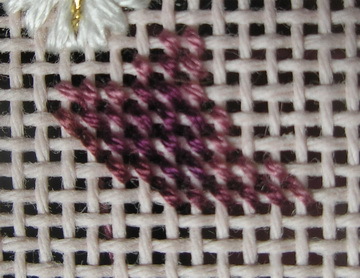 Letter I: This was one of the three most difficult letters to stitch. 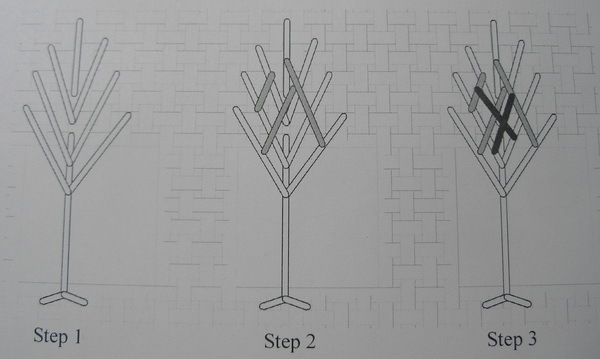 It has a lot of details and several different techniques required. 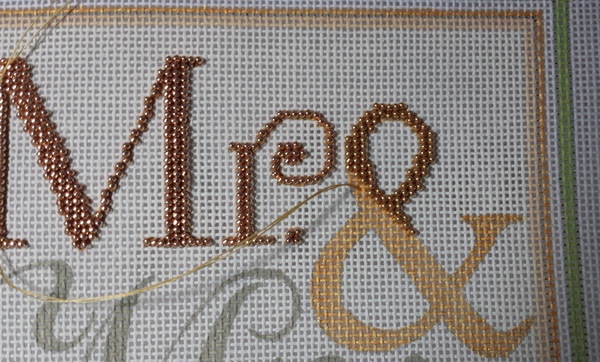 Letter C: I outlined this letter before I began the details of the stitch design. 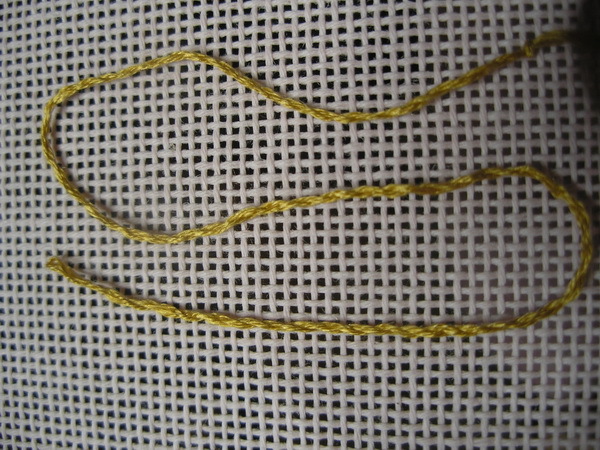 This is one of the major changes I made to the piece and one of the easiest to stitch. The curves of the spider web were supposed to be beaded, but I didn’t do this. 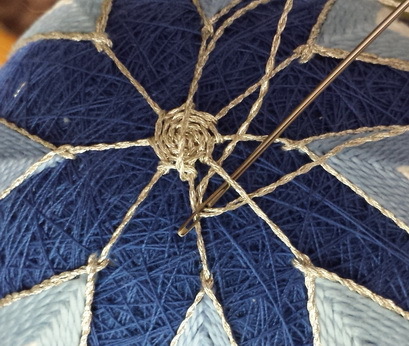 I stitched the spokes of the spider web first with a shiny braid and then couched the curves with the same thread using a thinner matching thread to couch (I either had both threads in my stash or purchased them). I couched the long line the spider was hanging from last. I used the unstitched picture as a guide but since the entire letter C was stitched in Nobuko, no black lines were showing except the thread the spider was hanging from and the spider and the background had been stitched over these too. So everything on this letter was surface applied. 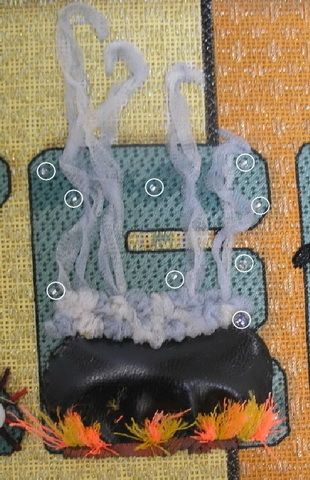 The spider was supposed to be beads also but I stitched the body in a Cashmere Stitch and later stitched the legs in Bullion knots. I left the stars (white circles) and spider legs (white rectangle) until later. 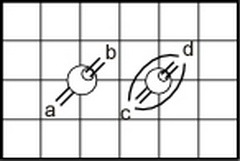 Letter K: Another difficult letter. Again stars (white circles) are stitched later. 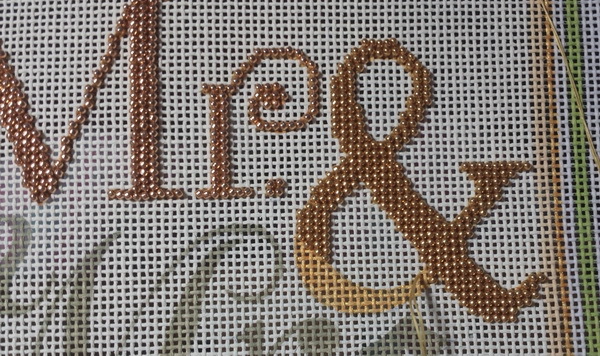 I really had to think about this letter and how I was going to stitch it so I took a few days to live with the letter and look at it closely. 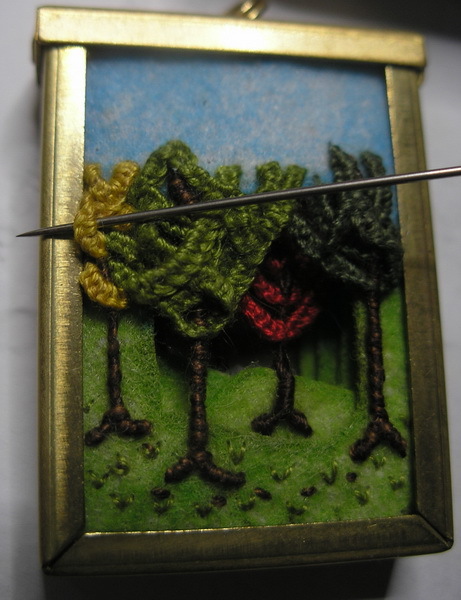 By “living with the piece” I mean I leave the needlepoint up in the stand and uncovered, so I can see it while I am working on another piece, sitting down to study the piece, or just walking by the needlepoint. 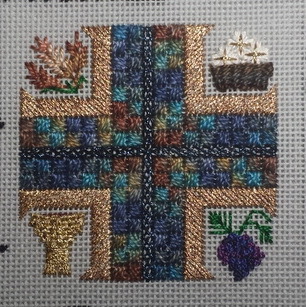 I had to decide the order I wanted to stitch and if I wanted to do it like the stitch guide suggested or whether I was going to add my own stitching to the piece. I even thought about moving on to the letter “E” but it was also presenting its own difficulties and I wanted to save the letter “D” for last because it was easy. So after living with the piece a few days and really looking at all three letters that were giving me some difficulty (I-K-E), I came to some decisions. 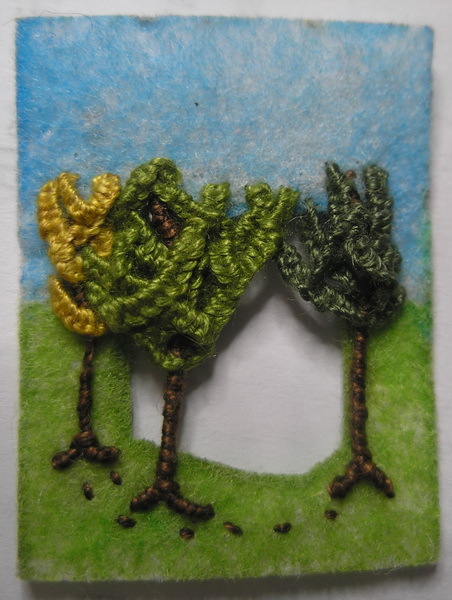 I made notes and checked the kit to be sure I had the things I needed and then began to stitch again. The wing took some thinking about but and I decided to do it more like a stumpwork attachment than what was suggested. The suggestion was a second canvas finished like a small ornament and attached along long top side to main canvas by sewing The wing was stitched on a separate piece of canvas, I outlined the wing in satin stitch over a wire that I used later to attach wing to canvas. I also could bend the wing to give it more dimension. I striped the canvas threads back to the stitching and wove them into the backside and covered these canvas threads with a piece of ultra-suede with an applique/sewing method. The wing was saved to attached later. 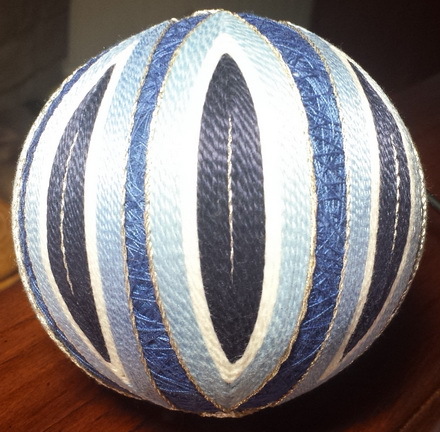 The pumpkin is self-padded with the same thread. 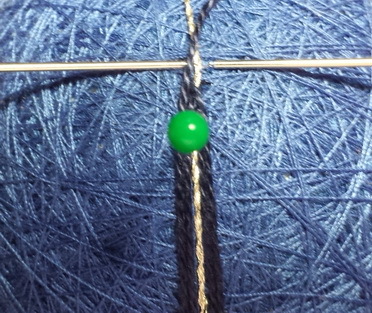 If this piece had not been kitted I would have used floss or perle cotton to pad but I had a bunch (3 skeins). I outlined the letter but left pumpkin curly-qs, eyeball veins, birds feet and wing application for later (white rectangles and oval). Letter E: I made more changes here too and even left some elements off. The easy part were the logs at the base of the letter. Before I did anymore I outlined this letter. 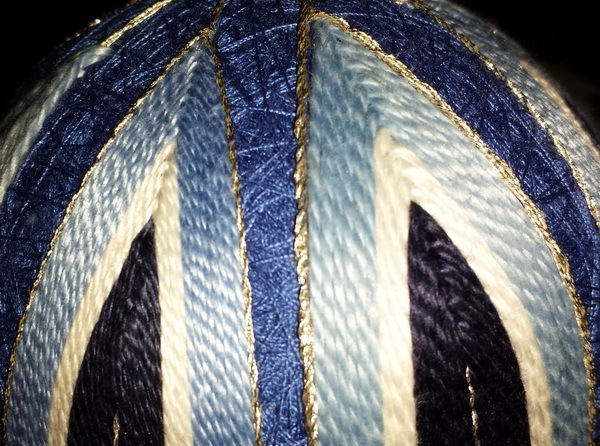 Next I tackled the caldron; I would have to say the applique of the caldron wasn’t that hard. It is a padded piece of black leather but I did not put the metal handle on the caldron nor the lip of the pot. I didn’t think a handle was necessary and the pot was boiling over so you wouldn’t see the lip. The boiling and steam were a challenge I ruched the Flair for the boiling portion and I tried the technique suggested for the steam but didn’t like the way it looked. I took it out (what a pain). 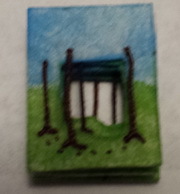 Since I was trying to cover the painting error; I wanted to be able to manipulate the thread. So I couched long lengths of Flair twisting as I applied for steam. The flames were the hardest, didn’t care for the fiber given for this, Flair didn’t work so I tried a glitzy ribbon. 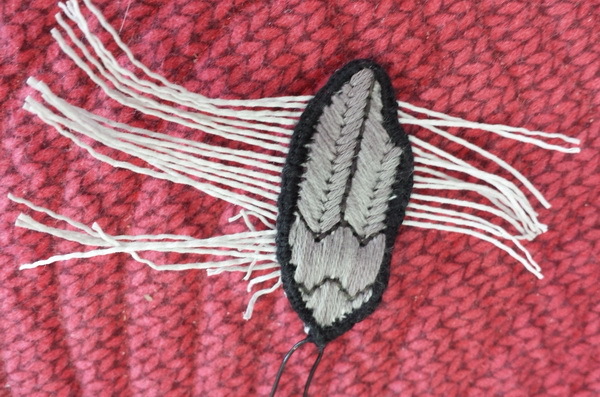 I stitched Turkey Tufting with glitzy ribbon threads and then frayed ribbon with a sharp needle. I like it better than the other ideas, but I’m still not happy with it. 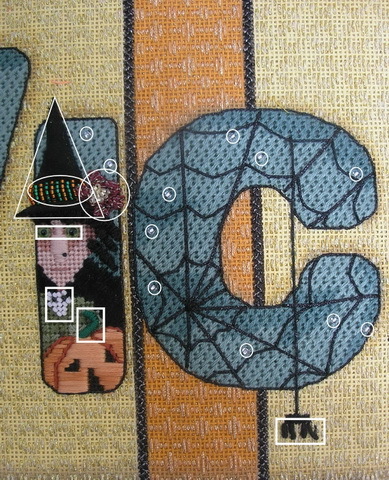 I will say, when I finished stitching this letter the only thing left were to embellish with the stars (white circles). 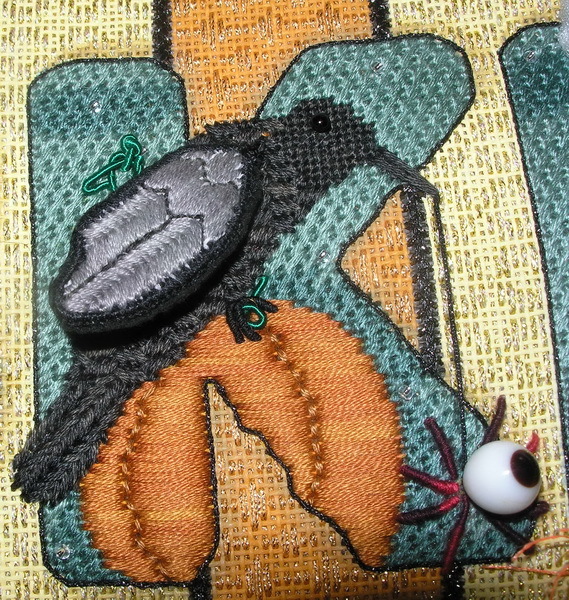 Letter D: Always good to have an easy part to complete stitching or almost complete stitching. The D and C were the two easiest of the letters. 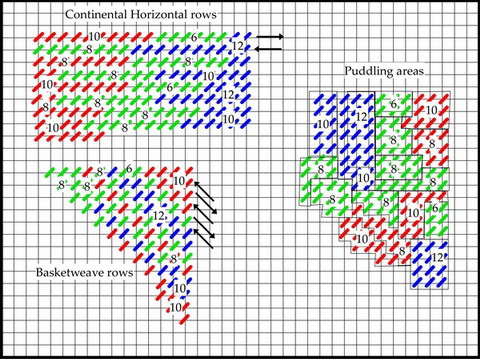 Small bats at top of D were Basketweave and larger bats (lower part of D) were Basketweave faces and Directional Diagonal stitches. 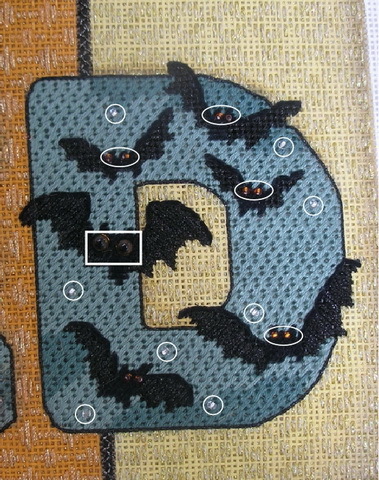 I outlined the letter “D” after I stitched the bats. I left the stars and eyes of the bats to bead later (white circles, ovals and rectangle). 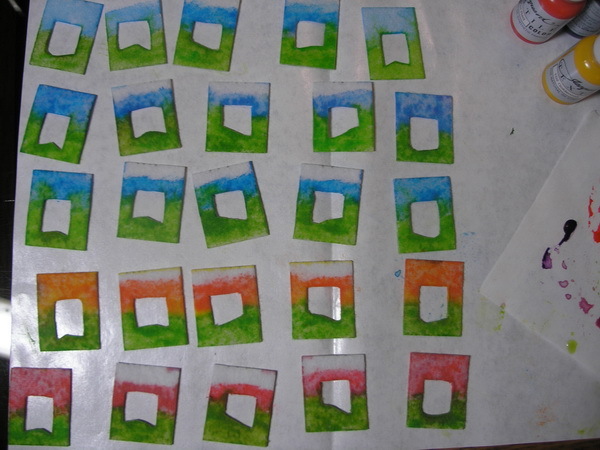 Next time we will do the embellishing. Later today I’m off to our first art show of the season and always one of my favorites. I may even get dinner and ice cream.